A colleague of mine recently was very excited because they were going to get a lot more hits on their blog. 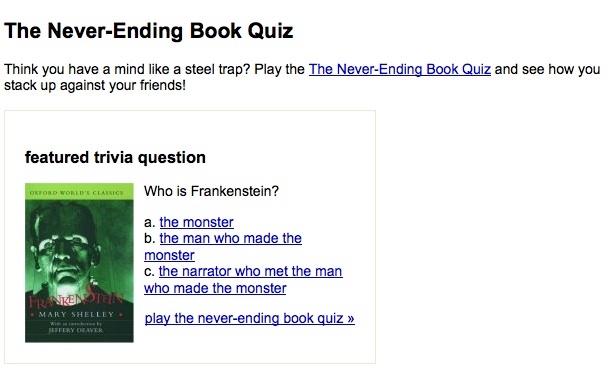 They were promoting it in an email newsletter. They had actually gotten the marketing department to agree to the first paragraph of the email and the subject line, for an advertisement of the blog. This was their third announcement of the blog, to lukewarm results. Initially a hundred or so hits on the blog (from 100K or so email list). And very few stuck around. The problem, I see, is that beyond the initial announcement, and frequent mention saying “check out our blog,” there is no reason to have a goal of moving an email list to a blog reader list, or seeming to communicate that to your readers. For example, your sister likes you to call her when you have news, your aunt likes a nice note card, while your grandmother would be perfectly happy if you saved it up for the monthly tea party. It’s the same news- that you’re imparting- but they all want to know in different ways. If you want the best results, you’ll cater to their preferences. The blog is just one way of communicating. It’s more like the tea party (than the notecard, or the phone call) to carry this metaphor out. So, why are people not really sticking around on the blog, from the email list? Assume the blog is fine- the main problem I see, is that those people really like emails, not blogs. They’re getting invited to tea parties, when they’d rather just get a notecard in the mail. What you want to do is get NEW people to the tea party that are ALREADY into tea parties. Viral, social marketing – what I call “community work” – attracts those who are already into that method of communication. What you need to do is read other blogs, bring content to the attention of other readers (already into blogs), and promote on communities, thread discussions, social networks, etc., the cool content of this company. It’s a lot harder work than simply sending a note to your email list, over and over again, that there’s a blog. But the potential payoff is huge- a segment of new, interested prospects. I see this on a larger scale- new technologies coming out, like Twitter- and marketing groups thinking they have to change or educate their existing mailing list. Mostly, because they had to train themselves. So, assume there is already a large segment of potential users who already understand this medium. Don’t take my word on it, check: http://search.twitter.com) and search for your brand. Blogs can be simply another marketing channel, and the effort shouldn’t be to convert people to social media, but to find new customer segments, using social media. It’s a hectic time in any retail email marketing department. The rule of thumb was that 12/21 was the last ordering date online if you wanted items to ship by Christmas, but since that falls on a Sunday, 12/18 is the recommended online shipping deadline. Therefore we have a 3-day lead-up in emails to push orders online. 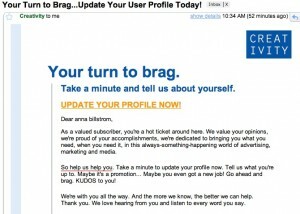 Here are a few examples of this year’s emails, wins and flubs. (Note: for a list of 250 companies and their shipping offers: Holiday Shipping Deadline. As usual taken with images off. Toys R Us consistently misses the boat on images-off rendering, with no alternative text, teasers, or HTML tables and treatments with colored text. They also don’t certify the email which would avoid the entire problem. With no teasers before the add-to-address-book reminder, this is a big corporate email campaign boo-boo. The only alt-text is below the preview fold, too. So doesn’t matter what size company you are- even the big guys miss it. 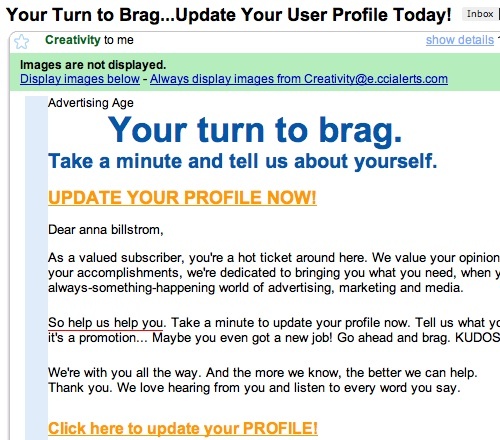 This campaign captures every best practice: teaser text before the inbox message, branding, and the offer is in alt. text, and no spacer images cluttering up the layout. Red Envelope used to be as bad as Toys R Us, but they’ve really cleaned up their act. Nice use of font sizes and color to promote branding even in images-off environments. Branding could be bigger. Pretty good in all the respects- branding, messaging and images-off design. A little jarring and not really in step with a usual very classy design, but still manages to get the message across. Nice to see Mom & Pops hit all the bases. I was disappointed to see this from the Discovery Store. Usually their images-off design is on par with Dell. So subtle to distraction, and the branding should be more prominent. Nothing seriously at fault, but still. It was hard to write this because I couldn’t find the branding! 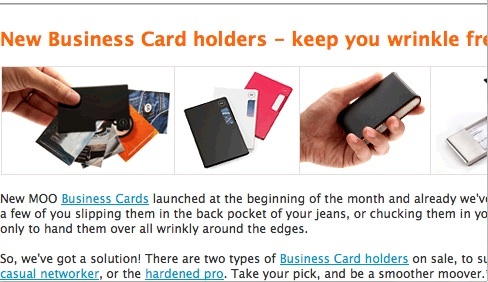 Companies really have to step up on the branding in their emails, for images-off. This is more a business question- why stock up on staples, during the holiday season? Last thing I’d want to give my niece is a set of t-shirts. So, uninspiring content, and no branding. Check Gap below for tips on how to do it. Wow. Use of color, and alt-text, but to uneffective ends. The branding is barely there, the toys are below the fold, and the odd use of green in the middle… I can see some valiant efforts but it falls apart. Just a quick note that certified email means that your message renders this prettily.They could have sent it without images, as it’s mostly just text, but it works: nice branding, dominant message, pleasant color combination. Just like any given customer’s inbox, we get a lot of emails and have to discern who they are from, if we are interested the products or offerings. To make my point about images-off, and designing for it, instead of lecturing, I decided to make a game. Try to figure out the company of each email below. - Lack of Alt text on the dominant images leaves you wondering what it is, and it’s a missed opportunity. - Nice use of teasers at the top- in text. They really give nothing to the images-off reader. I have the coupon code in the teaser text, and that’s about it. Really poor HTML design, and like most clothing retailers, they leave it all to one image without intriguing alt text messaging. CW really does nothing for the non-image viewers. They also are putting the coupon code in the subject line. I wonder if opens and reads increases or decreases with that direct method. One risk one of my clients always had to manage was whether discount web sites would pick up the subject lines and publish, making it a little less “web exclusive” and special. Still, a sale is a sale, so if they’re getting purchases via that site as well as that specific customer, maybe it doesn’t matter. 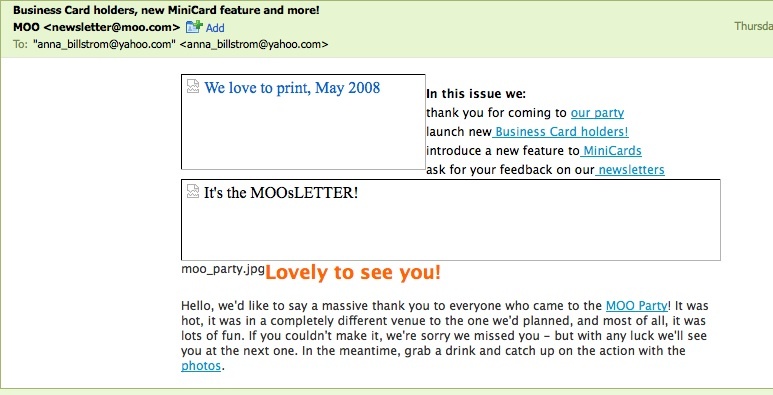 I’m comparing two newsletters from companies that I admire- Moo, based in England, that makes tiny Flickr-based business cards, and GoodReads, a social-networking bookshelf comparison tool. Both companies have upbeat, fun, jaunty styles and a slimmed-down, spare aesthetic. Here are both newsletters as I first saw them, above the preview pane. 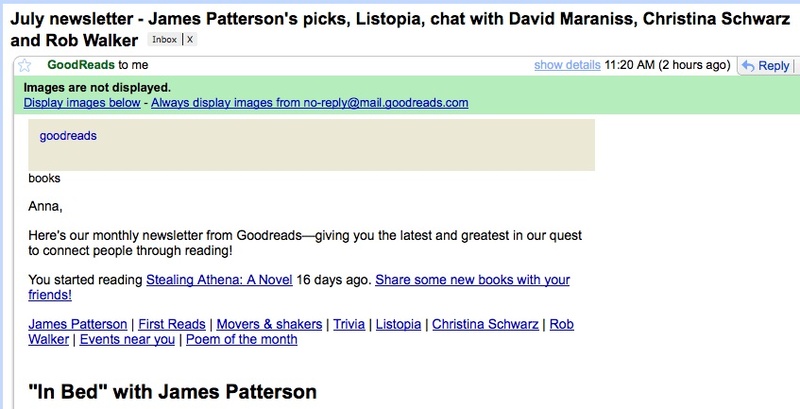 Moo came into Yahoo Mail on the Mac-Leopard and Firefox2, and GoodReads on Gmail same platform. Images suppressed, then images shown. … and with images on. 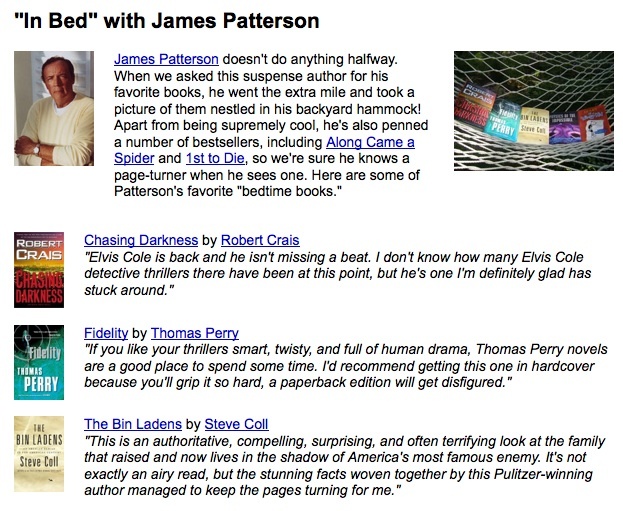 Good: They do a great job adding that teaser headine, “In Bed wih James Patterson,” and personalizing the newsletter by inserting my latest activity- saying I was reading Stealing Athena, and giving me an action to review the book and further participate in the community. The simple style and lack of spacer-GIFs means that with images off it’s still a good-looking, provocative email in my inbox. Bad: They don’t do a lot to drag me into the lengthy newsletter. The table of contents isn’t labeled, and since it’s all in one line it’s a little hard to scan. Also, the alt-text “books” is somewhat confusing. I’d almost just leave it empty, as it’s an unimportant and irrelevant graphic. 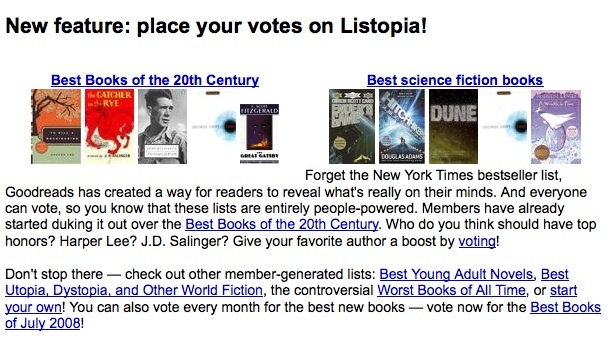 There’s also a separation of action: click on the book to review it/ become more engaged with the site, as well as “read on…” I’m not sure what the solution is, and this is somewhat endemic to newsletters- so many launch points, that you don’t keep the reader entrenched in the reading process. One way to break it up is to add a columnar table so that there is more going on above the fold. One client of mine found that people re-read and re-access the newsletter multiple times, so having two calls to action isn’t necessarily an issue, from a user-interface perspective. … and with images on..
Good: Wow, I love that photo! I also like how the “inside this newsletter” is off to the right and above the welcome message. This is a really dynamic letter and really communicates the fun aspect of their company (who would have known making business cards is fun?) I can’t say enough about the “inside” series- it’s short and easy to scan, and does a great job of bringing me into the newsletter. Also all of these links are internal, which keeps me in the letter and not off into the Internet somewhere. Great focus and design. Bad: There are a lot of tactical & technical issues, though, with this email. The alt-text flows oddly, which could have been solved with better alt-text and HTML formatting. The “Yipee” doesn’t make sense to me and is misspelled, and graphically creates a balance with the logo, but also overshadows the logo droplet. I’d just take it out. Also, the images-off version is a lot duller than the images-on, and the alt-tet doesn’t entice me to load images. I’d make a funny caption for the two guys and that would have worked, making me load the image. I’d also shorten up the intro paragraph quite a bit- rambling about a party I didn’t go to is kind of off-putting, and takes up valuable space. Good: it’s short, Bad: it’s boring as hell! I also would suggest that they use their branding in their subject line to further substantiate it, and help the open rate. Good: it’s obvious, bad, it’s a July Newsletter, but from who? The branding is hidden in the domain, so I’d push the GoodReads word somewhere in the subject line, and it’s way too long. Short it up, take newsletter out, and make it funny. Also- I’m not a fan of no-replies, as I think it doesn’t really fill the consumer with warm squigglies, and generally you should have a reply loop and feedback loop setup. It’s almost just polite, I mean, I write to you, you can write back to me. I stopped taking screenshots at #5. I’m serious! Here are the first few, then I’ll spare you. 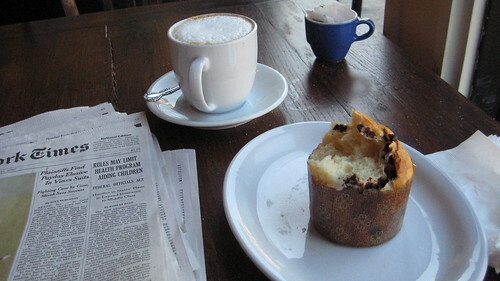 The Good: There’s lots of engaging content and you can really sink your teeth into it. Book covers lightens the text-heavy load, and they’re showcasing their insider author knowledge. Also nice design- by using graphics as breaks in content, it nicely divides up the areas of interest. The Bad: I know email is cheap, and online publishing means you can write and write, but there is something about abusing the poor reader’s attention span- espcially onine in the frenetic world of web2.0 and inboxes. Yes, they have a readerly audience, but a lot of the good content later on is not being read because it’s too in-depth in each area. I’d suggest linking off to the site for more information, and more use of summaries and teasers. Also, the HTML formatting is too roomy, tighten it up more. Yep, just 2 screens. Short & sweet, almost too sweet, as Moo tends to take cutesy too far sometimes. 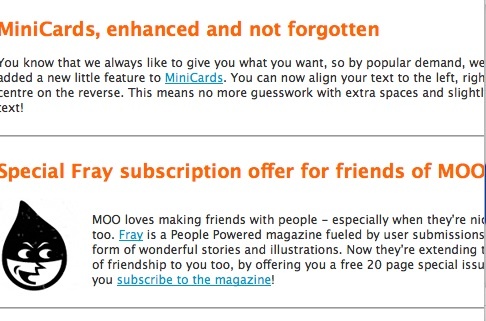 One issue I have with this newsletter is actually with its content- Fray doesn’t seem related to Moo at all. That’s one problem with partnerships, if it’s not a relevant connection, it can really detract. “We like nice people…” ??? Part of the over-cuteness, perhaps. PS. 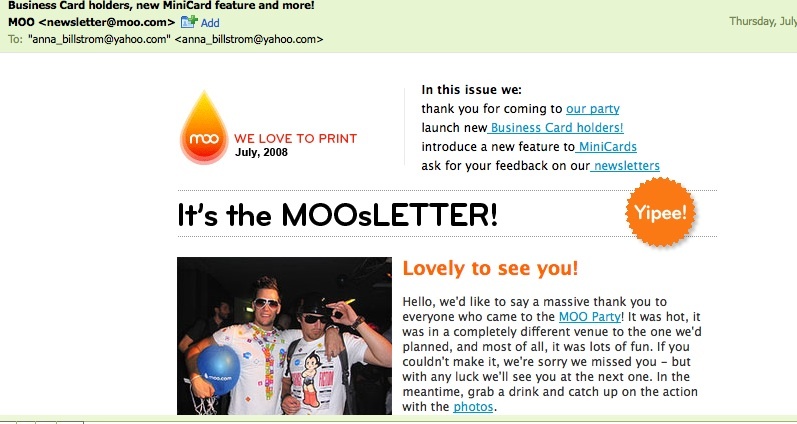 We hope you’ve received this newsletter because you signed up for it on moo.com. If you didn’t sign up or you need to unsubscribe, you can unsubscribe here. We’re sorry to see you go, though. Cute, fun, and … not CAN-SPAM compliant, as there’s no physical address. Sad, as they’re doing a lot of great things. I also worry about over-twee writing, and Moo seems to verge on on the cusp of that. First, a long poem that they reprint (because they are artsy!). ps. Goodreads is hiring developers! This email was sent by request to banane@gmail.com. They too suffer from lack of CAN-SPAM compliance, which is a pity. Well, what can you say? As we all know it’s a long road to making getting these emails up to snuff! 1) Find the popular kids. It’s high school, I know, but there are mavens out there and they can make your job a lot easier. For a friend who works in a software platform company, I told him to find his highly networked colleagues, and where they’re posting. Twitter? OK, then join twitter and plurk for a while, find out if it’s worthwhile. I setup two Twitter accounts- “advent_in_email”, and “banane”, and tried to separate them between work and play. Well, my personal one had a lot more followers, and I couldn’t keep my twitter accounts straight, so now I follow a policy of mostly work but some play in my twitter comments. I have to admit I enjoy the personal posts of those I follow as well. So it’s a brave new world of mixing work & leisure. 3) You’re not a stalker! There’s this fear that people are stalkers- and you’re not- though each platform has a different way of following, and for some it’s far more personal than others. 4) Does it really work? I refer people to Jeremiah Owyang’s Web Strategy blog, the “social networking” category, quite a lot, when they start asking questions about business justifications for social marketing. He has a ton of posts and he actually meets with these companies and asks the hard questions. Zappos is a poster child for social marketing, and there are various case studies I’m posting all the time on companies doing it right. 5) It’s such a time investment! You can be strategic in the use of your time. It’s getting easier and easier each week as more applications are developed to centralize this stuff, too. Lately, an account on Digg, Flickr, and Twitter, with FriendFeed as a reading location for you, will pretty much accomplish a bare bones but effective social marketing campaign. Set aside an hour, keep it frequent (3-4 times a week) and you’re good. I also suggest not doing everything at once- join one platform, get used to it, join another, get used to it, etc. Yes. I’m a writer so it’s not that stressful for me, but as a writer friend told me the other day, “for some people writing is like doing taxes.” LOL. So if you’re not a writer, I’d create a blog that was just a set of links, every day, basically your “digg’d” articles, and blogs you read. Or just use your blog as a living resume. No need to write your deep thoughts each day. Blogs seem to be getting phased out, so it’s not an end-all solution for many companies. The Online Participation Factor, by Justin Korn, and more interesting perhaps is his quantification of participation during a 24 hour process: FriendFeed Followers: Lurking or Participating? Great test & article by Ron on Email Marketer’s Club, Tamara Gielen’s community for Email Experts (join!). He did some tests on whether encoding- including the image source in an email using base 64- would avoid the image blocking of popular email clients. The result? They are still blocked. I’ve heard this solution for years now, on various comments on blogs. I’ve never recommended it. I have an unproven suspicion report from Ron, below in the comments, that it increases the file size, which sets off all of these spam alarm flags, and makes it inconvenient for your subscriber base. I also don’t recommend crafty technical tricks to avoid spam filters. I’ve clicked on this email in my inbox a few times, and when I finally opened it, I was like, here is something new and interesting going on in email marketing. 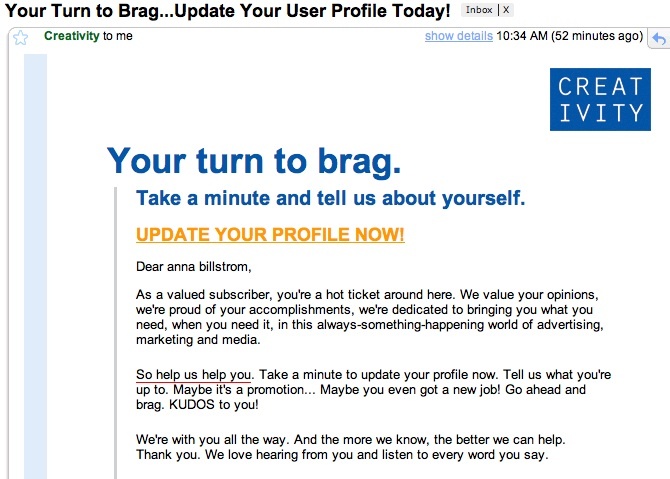 Catchy subject line: “Brag About Yourself!” – which, for its target demographic, ad agency employees, agents, marketeres, etc., will hit an appreciative audience. The directness and tongue-in-cheekness also works well, for advertising folks who appreciate good copy. Nice images-off management design-wise. Check the font size and width. It works with the branding and the images when you load. Very nicely done. Only one or two broken images that do contribute once loaded. No spacer GIFs so a very clean layout with images-off. There’s an offer, but it’s most a call to action to make the “open” a “click”. I think this is good- offers in subject lines, motivating the open, tend to attract the discount shopper, which is a less meaningful segment. In this kind of offer, I think they get far more opens with a non-offer subject line. Why focus on it? I’ve dedicated a lot of bandwidth to the issues of designing for images-off. I was delighted to read today an article by Mark Brownlow- a great round-up – in which he mentions that a MarketingSherpa case study that shows with proper images-off design technique, said company recognized *four times more* revenue. I did an analysis for one of my clients that reavealed: 11% of the click records were from images-off viewers, from a single email drop. That means: the recipients clicked through, even though they didn’t see the images. * That is a very significant percentage to me- and it was a promotional, weekly message, not an introductory message, which you can guarantee, always has images suppressed. To put it into scope, for that campaign they had a 2% of delivered purchased, so 10% of clicks being non-images was very important to them. Also, 10% represented their Gmail population, 10% represented a significant boost in revenue if they catered more to this target demographic. AOL is a smaller percentage, but this client dedicated serious resources to getting deliverability issues resolved. The most impressive response I got on the “11%” number, though, was from the creative group. Used to publication and prints- as Mark mentions- image heavy content is required. So finding out that the consumers were compelled by offer alone really hit home. * Question that metric? This is how I did it. Take your clicks records, and re-query the database and find out if they have an open record. If they don’t, this is your non-open clicks, and represents the percentage of your campaign target that opened by only seeing the images-off version of your creative. I’ve been taking screenshots of various emails I get that are using interesting design techniques for image-suppression, and noticed this mini, micro-trend with online travel companies. Both of them fail in the branding category. See how long it takes to figure out the sender (from the message, not the address!). - Include your name in the upper left hand corner, via alt-text, or HTML text in a table, or just raw text. No other words in front of it. Note how, in a couple of places, REI just says “REI” or “REI …”. It’s easier to scan, so it stands out. - You can use HTML font styles to mimic logo restrictions, but unfortunately it’s only with installed fonts, so there’s not a lot of choice. Other comments on the travel samples: Orbitz does the no-no of using light blue font color on top of a dark blue table background color. Looks like it’s styles applied to an image link, which then applies to the alt-text. In other places, looks like they have styles applied to links, so they just need to clean up their CSS and check all use cases (images-off, namely). Orbitz is doing a lot of things right: color use, with table background colors, does communicate brand to a degree, and having meaningful offer text as alt-text. Also, having a menu that is in text and using HTML tables and not just images. We’ve come really far since image suppression started full steam ahead, last Jan.
Not just to pick on Orbitz, Hotwire has the same blend of good and bad techniques. Good- nice clean layout without the overuse of spacer GIFs. A little bit of work with tables and they could manage the menu heading with out GIFs, but who knows, maybe that was a concession between an email marketer and a designer! I like the use of color, and HTML text for the heading. The problems? The key would be branding, and alt-text. I have no idea what those images are, so I’m not going to be inclined to allow images. That’s a loss in metrics for Hotwire’s marketing folks, and probably a loss in images as a sales tool- especially key for travel where the photos fill the fantasy. So I’d put the offers in the alt-text, or allude to the photos with funny and clever alt-text. Besides avoiding spacer gifs, branding issues & alt-text, this is a great email design for images-off.